C.J. Burks drives for a layup against WKU. 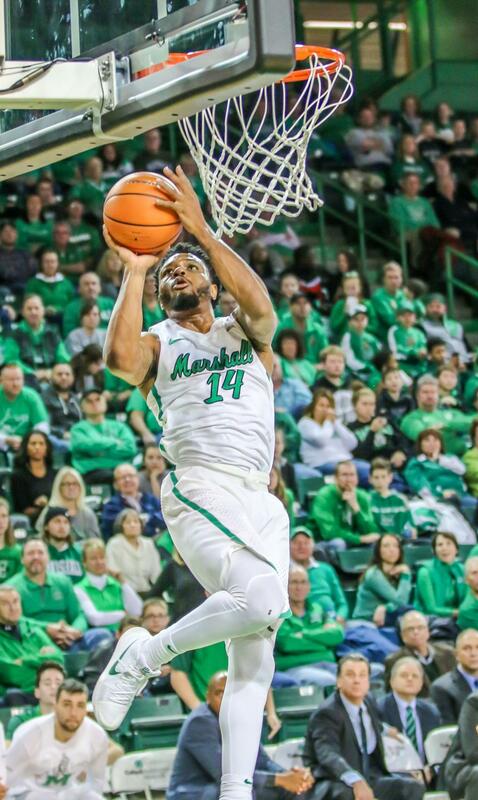 Burks had a game-high 24 points in Marshall's last contest against ODU. Marshall University’s men’s basketball is slated to take on the University of Alabama at Birmingham Saturday in the second game of their home series. Last season, Marshall and UAB split the two games they played, both in a blowout fashion. The first matchup between the two teams last season was at UAB, and the Blazers defeated the Herd 94-78. In the second game at the Cam Henderson Center, the Herd was victorious and beat the Blazers 74-59. Junior guards Rondale Watson and C.J. Burks said their focus is to play a complete game against the Blazers. The Blazers are third in conference standings, and have three players averaging double figures: Chris Cokley, Zack Bryant and Nate Darling. In last year’s games, points in the paint, points off the bench, and points off turnovers seemed to be the deciding factors. In the first matchup, the Blazers tallied more points in the paint and off the bench than the Herd. In the second matchup, the Herd had more points in the paint and off turnovers. The Herd has been plagued with injuries and sickness, and head coach Dan D’Antoni said his team still has not seen their best. In regards to looking forward to the matchup against UAB, D’Antoni said it’s just all about playing the game. Marshall and UAB match up this Saturday at the Cam Henderson Center at 7 p.m.